"Within a few years, by My special grace, you will be a saint; you will work miracles and will be raised to the honors of the altar” -words of Jesus to Gemma in March, 1901 (Positio super scriptus, page 23)." 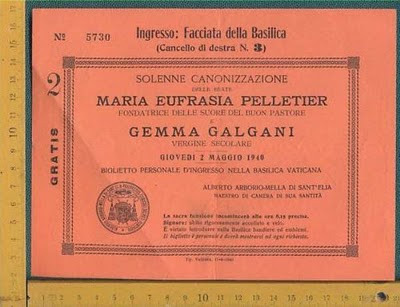 The official Church process that eventually lead to Gemma’s canonization began in 1907. 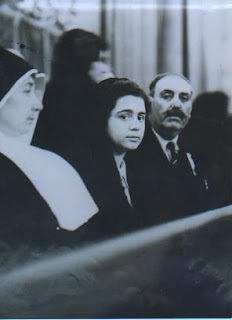 The cause was initially led by her spiritual director, Passionist Father Germanus Ruoppolo CP. At that time Father Germanus was also the Postulator General for the cause of Brother Gabriel Possenti CP (now Saint). 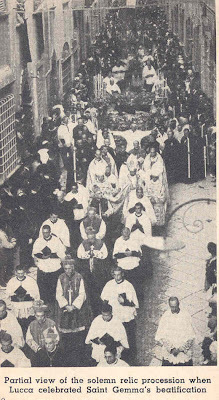 Between 1907 and 1910 the preliminary Diocesan inquiries (Processi informativi) into her virtues were held in Lucca, Italy. At this initial first step, she is officially considered a "servant of God". Declared BlessedA few months later, On January 5, 1933, Pope Pius XI approved of the 2 miracles proposed for the Beatification, and on Sunday, May 14, 1933 she was raised to the honors of the altar and officially declared "Blessed Gemma Galgani". 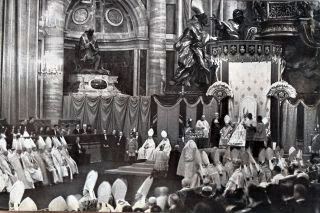 The two miracles used for the beatification were from 1907 and 1919. Two more miracles were required for canonization, and these are under heavy scrutiny by a team of Physicians and Theologians. The miracles must occur after the beatification. Out of a large number of miracles that were attributed to Blessed Gemma since her beatification, two were selected to be submitted for examination to the Sacred Congregation of Rites presided over (at that time) by his Eminence, Cardinal Januario Granito Pignatelli di Belmonte. The investigation of these two miracles fills two folio volumes. Elisa Scarpelli, a 10 year old child from Lappano, Italy. Elisa had cancerous ulcers spreading from her left jaw to the upper part her neck that began in September, 1932. She was first taken to the family physician, Dr. Augustine Intrieri, who initially treated it with a linseed poultice, without affect, then he opted for a surgical operation to remove the ulcers, which failed. She was then taken to another Physician, Francesco Guido, who applied various external ointments, to no avail. Afterwards several other Doctors tried numerous remedies, without any positive effect. On the day of Gemma’s Beatification, Elisa, upon hearing that Gemma was to be declared "Blessed” by the Holy Father, Pope Pius XI, on that very same day she took a picture of Gemma, and full of faith and hope she removed the bandages from her face, and applied the picture directly to the cancerous ulcers. She said quote "Gemma…..look at me and have pity on me; please cure me!” The wounds were instantly healed. She looked into the mirror, astonished, and cried out “Mother!” Her mother, who was in another room, immediately entered and upon seeing her daughter completely cured, was overcome by emotion. Physicians afterwards attested to this miraculous cure, as is required by the official canonization process. Miracle II: The second miracle also occurred in the town of Lappano, Italy. 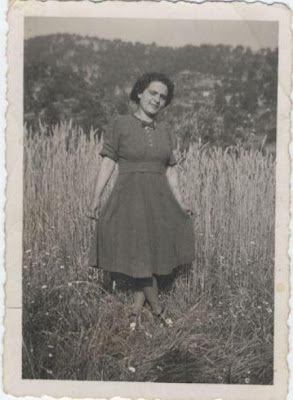 Natale Scarpelli (no relation to Elisa) was a farmer with a wife and one child. He began suffering in 1918 with a severe case of varicose veins in his legs. An operation was performed, and this helped until April 3, 1935, on which day he wounded his left leg in an accident. Soon after the accident, a painful, festering ulcer appeared. A few weeks later, on May 18, 1935 he was obliged to visit the family Doctor, complaining of the large sore and severe pains in that area of his leg. The local Physician, Dr Valentini, diagnosed an ulcerous tumor in the leg. The physician prescribed a treatment, which was of no effect, and the ulcerous wound began to spread and discharge matter. The family happened to have a relic of Gemma, so the mother, father and daughter all prayed to Gemma together, promising her that they would make the cure known, if it was God’s will that he be cured. The daughter then took the relic of Blessed Gemma, and made the sign of the cross over the ulcer. A few minutes later, Mr Scarpelli felt unusually well, and teased his daughter saying “now why did you not thinking of placing the relic on my leg long before”. Surprisingly, Mr Scarpelli soon grew very tired and fell into a deep sleep, something he rarely did because of the severe pains in his leg. The following morning when the family awoke, they discovered that he had been miraculously cured, the huge ulcerous cavity had been filled with fresh skin, the pain was gone, and he was able to get out of bed and walk normally. Although the large painful ulcer was completely healed, the varicose veins in both legs remained, as if to show that God, although curing his painful ulcer that completely incapacitated him, intended for him to suffer this particular malady, and what was most important for those concerned was that he could now walk and work and support his family in their necessities. The family Physician afterwards attested to this extraordinary miracle along with another Physician, Dr Jacobelli, who later wrote ”This miracle is not only incomprehensible but it upsets all the physiopathological laws of the medical field. It must be remembered that there lies a monumental difference between an ordinary infectious wound and a varicose ulcer”. Both miracles were submitted by the Holy Father on December 8, 1938 and on March 26, 1939 Pope Pius XII officially recognized them. Gemma was canonized the following year by Pope Pius XII on May 2, 1940. On that day Gemma officially became Saint Gemma Galgani. The Sacred Congregation that examined St Gemma's life did not take into account the extraordinary spiritual graces that were given to her, for example the stigmata, the crown of thorns, the sweating of blood, the scourgings, ecstasies, her miraculous cure through the intercession of Blessed Gabriel (now a Saint), or any of the other extraordinary gifts and graces that surrounded her life. The Church made no pronouncement or judgement on these supernatural gifts, canonizing only her heroic virtues. I founded this St.Gemma's blog and I loved it because she is so special in my life and in my husband's life.Thanks God for this inspiration! I'm from Brasil and here she is not so known. Hope u could understand my english. Kind God, Sweet Mother and St.Gemma bless u and your family so much! In Domino et Maria semper! Hello! Thank you for your kind comment. I am so happy to hear that you enjoy the website and that you are devoted to Saint Gemma! For me, it is really a "work of love". God has given us many great saints! We are very blessed to have Saint Gemma as one of those saints! I enjoy your blog Mr. Dallaire! very nicely done. You are most welcome to visit my blog as well. have a blessed Sunday! I visited your blog and read that you came into the Catholic faith last year. What a wonderful grace for you and the Church! I am almost ashamed to say I knew nothing of St. Gemma. While looking at another site, I "stumbled" across all this information about St. Gemma and have been reading for hours. I have learned so much from everything you have offered here. I don't think it was just a "coincidence" that I found this information. Bless you in your role in all of this! Thank you. It is a pleasure to meet you. I am glad you enjoyed the website. I agree...I don't believe in "coincidences", only in God's Providence in all things. What a beautiful website! I was named after St. Gemma and I never tire of reading about her. God bless you for all of your good work. Thank you for your kind comment. You are blessed to have Gemma as your patron and namesake! St Gemma did miracle in the life of my nephew who haved dengue fever, she cured it in the well of the Lord Jesus Christ. I have made an awesome connection with saint Gemma as I suffer from back pain. Reading her diary is very inspiring and encpuraging. I plan on taking her name at my final Oblation. Thanks be to God. I have read all that I can find about St Gemma several times and I will probably read everything about her several times more. She was an incredible Saint while living and she most certainly is one now in heaven! I love Her as if she was here right now and I truly believe most of your readers feel the same way too. St Bernadette has always been one of my.favorite saints and have prayed to Her since I was about ten, I've only known St. Gemma for a few weeks but it seems like a lifetime. I'm now seventy-seven. Thank you!